In February, having scooped the Nursery Stock Grower of the Year Award, the Bransford Webbs Plant Company, went on to be crowned overall Ornamental Grower of the Year 2016 at the prestigious Grower Awards. Hosted by Horticulture Week, the award was sponsored by ICL. With a well-earned reputation for quality and consistency, Bransford Webbs is constantly investing, innovating and adopting new technologies and management techniques to improve productivity, its product offering and customer service. Constantly expanding and adapting this forward thinking company has doubled in size in the past 10 years. Growing a wide range of hardy nursery stock, totaling 1.5million plants annually, Hebes remain the core product line with 300,000 being grown this year. Hellebores are another key group accounting for 100,000 units. As a result of its in-house programme, Bransford Webbs is introducing nine new varieties this year under the Hebe Red Wine and Summer Drinks brands. Bred by Karl O’Neill, in his role as propagation manager, the new introductions are highly floriferous and include Hebe ‘Burgundy Blush’ and ‘Ruby Port’. As Karl (acting production manager) explains, while the Hebe are fairly robust plants, it is particularly crucial to get the growing media right for crops like Hellebores grown from a small plug to final size over 12 months. Karl works closely with ICL’s technical area sales manager Steve Hughes to identify the right products and specifications to match individual crop needs, often tweaking recipes for mixes annually. 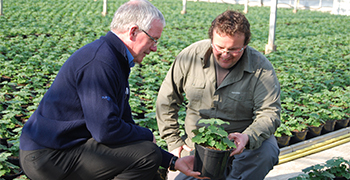 “ICL’s custom mix growing media programme – recently rebranded Levington Advance Solutions – helps us maximise each crop’s potential,” he says. At the endhe season the production director, Christine Chalmers (currently on maternity leave) and Karl sit down with ICL technical manager Andrew Wilson and Steve Hughes to discuss any particular challenges. “We review crop performance through the season and might change factors such as the longevity of the Osmocote controlled release fertilizer (CRF) or the bark content to improve drainage,” explains Karl. As part of the grow, nurture and protect Levington Advance Solutions packages, Exemptor (thiacloprid) is incorporated in all liner mixes - except for edible crops.